The P series horn was introduced after M horns became unpopular on railroads due to their high maintenance characteristics. P horns, unlike M horns, can have bells placed at any position on the manifold, and have common internal parts. Any of the bells can be reversed at any position on a P horn manifold. These horns don't need to be tuned, and dont have any metal to metal contact which creates wear. This means a P horn, with the normal replacement of the internal parts (rubber seat, gaskets, and diahpragm disc) which are sold as a kit, will not wear out. P horns are also very air efficient which doesn't really make a difference to a railroad, but is good for collectors with a limited air supply. 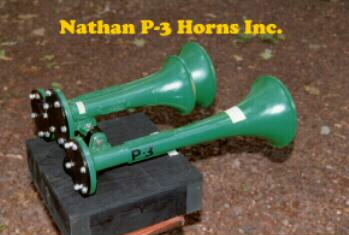 A P5 horn would consist of the 1, 2, 3, 4 and 5 bells, while a standard P3 has bells 1, 2 and 4. 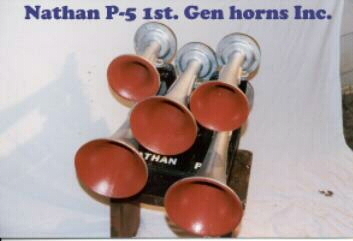 P3 horns usually come on a P5 bracket with the top two positions blanked off, but a dedicated 3 chime bracket was made and is still offered for P horns. 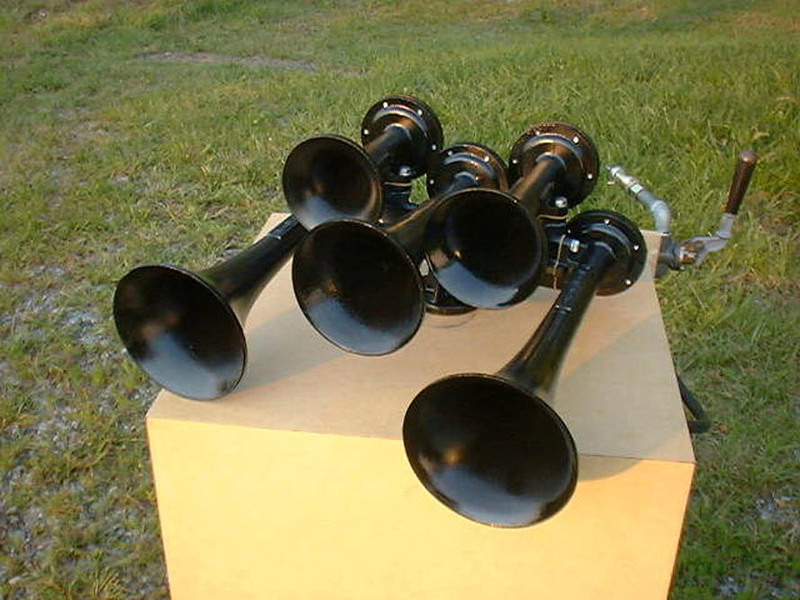 Deane Ellsworth, who was the "horn guy" for Amtrak came up with a new idea for the P5. He got Nathan to make a special #4 bell, which plays A# instead of A. A new P5 was born, the P5A (A = Amtrak). This had bells 1, 2, 3, 4A, and 5 and was ordered on Amtrak's first F40's 200-229, also seen on the P30-CH, and Turboliners. This was also the introduction of the low mount P bracket. A P5A will come standard with a low mount. Another type of P5 was thought of which introduced the #0 bell. 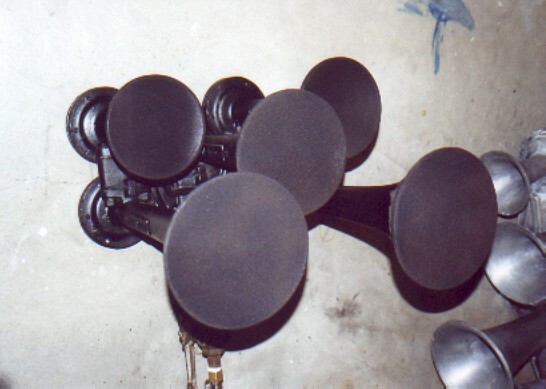 The #0 bell plays low A (220 Hz), and was used in place of the #4 bell. This horn uses the 0, 1, 2, 3, and 5 bells, and also a low mount bracket. There is no official short hand for this horn, so it is referred to as a P01235, or "0 bell P5" for short. These horns were used on Amtrak's E60 locomotives, and I beleive that is their only major railroad application. Around the mid 1970's the sound of the P horn started to change. New castings that aren't accurate came into play and resulted in most of the bells to play different notes. The 0 and 4A bells castings haven't changed, but the 1, 2, 3, 4, and 5 bells have. However, the #4 bell is the only one to still play the same note. The main visible differences are that the older cast bells say "PAT PENDING" near the foot of the bell, and the newer castings are abbreviated "PAT. PEND.". The flare of the bells are also different, but that is hard to notice unless you have both styles infront of you. The P Horn Photo Section. All recordings are for Personal Use ONLY! On board recording of CSX SD40-2 8835's P5 on a low base recorded 9/01. Amtrak F40 206's P5A recorded 3/01. Amtrak F40 210's P5A recorded 3/01. P5A on an Amtrak F40. A P01235 on Amtrak F40 #226! Recorded 9/01. My P5A on the 3 piece base (from an Amtrak E60), 9/01. My former P5AM (Modified - the 1 and 5 bells now blow "C") on Amtrak P32AC-DM #707. 12/01. My P5A, recorded in the kitchen, blown in the basement, 4/01. Elwood Belknap's P01245 horn, 12/00. P5A on an Amtrak F40 leading the Lake Shore Ltd.. 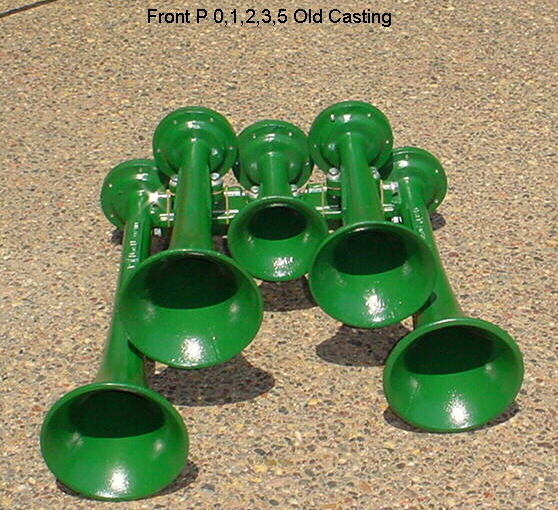 Various P horns with mixtures of "New" and "Old" Cast bells. My "P5LAC" (Low mount, 4A bell, Combination of new and old bells) with a Old #1, New #2, New #3, 4A, and Old #5, blown at Elwoods, 12/00. My "P5LAC" blown in a field behind Brett's house - summer 2000. P5LAC belonging to Elwood Belknap. P3 on UP #4090 in Centerport, NY - 4/01. P3 on CEFX lease unit (SD45?) #3138 - 4/01. P3 on a CEFX lease unit (SD45?) - 2/01. P3 on UP #9824, recorded 3/01. P3 on SSW #8065, recorded by Mike Muha at Dolores Yard in Carson, California in mid-1995.